Licensed to drive dragsters at the age of 16, Frank has spent his life driving some of the fastest machines on the planet. 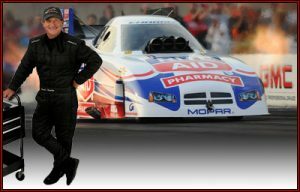 He built his racing career piloting 330 mph Top Fuel Dragsters and Nitro Funny Cars in addition to obtaining NHRA competition licenses in 6 other categories. Over the past 3 decades Frank has taught thousands of drivers how to improve their personel performance, on and off the track. When not teaching regular driving classes, Frank consults with many of NHRA’s top professional drivers.